Epic Thirteen , the worlds first Quadruple Brut IPA, a beer recommended to drink at ‘cellar temperature’ so I had to look that up. “Your strong beers (like barleywines, tripels, dark ales) will be their happiest at room temperature (55-60F), most of your standard ales (like bitters, IPAs, dobbelbocks, lambics, stouts, etc) will be at cellar temperature (50-55F)” For the Metric amongst us that is somewhere in the 12-16c range, which is NOT room temperature. 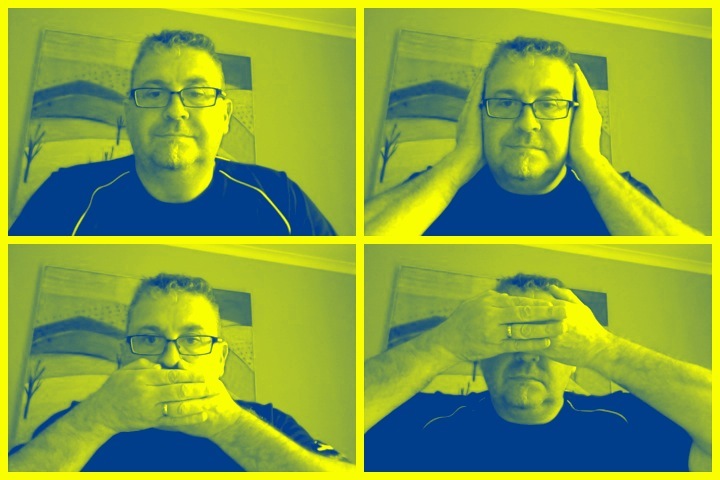 Which i all fine and dandy but I don’t have a temperature device, and it’s around the 28C outside at the moment. And then because the magic of time between I now have a temperature device, so I’m about to have hilarity with that. 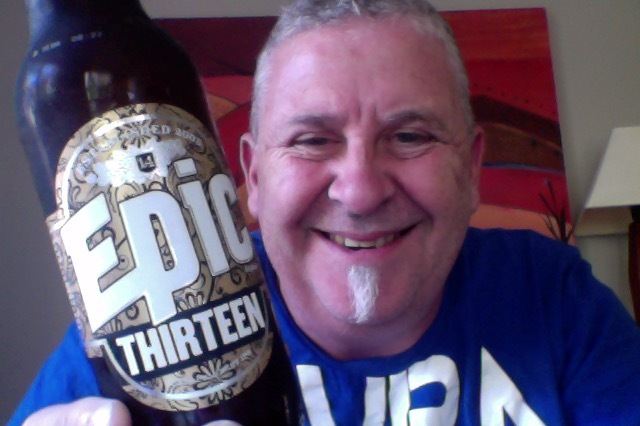 Epic Thirteen fit into a style that is of an IPA – Imperial / Double. It is brewed for Epic Brewing Company (NZ) By Steam Brewing Company in Auckland. ‘Brut’ is also the new black, and so far they’ve been a real mixed bag of hit and miss. style, we have delivered this incredible boundary-pushing beer. It has a bone dry finish that is balanced with the alcohol sweetness. Don’t chill it too cold as the bitterness can become out of balance. So we thought rather than starting over we would just be thankful that the THIRTEEN is so EPIC. To keep the beer as pale as possible we have use a large proportion of Pilsner malt. After we had dry hopped the beer, the high alcohol, and dryness, needed way more hops, so we added the same amount of dry hopping again. Double Dry Hopped. For a beer that is 15% it is surprisingly easy to drink. It is also double dry hopped – because you’re worth it. It has a lovely sweet aroma on opening, I really mean a lovely aroma, sugar sweetness with a hint of hop green. Glorious start. Lovely looking in the glass a golden orang brightness about it, and I’m going to forgive th lack of head. The colour is almost glowing, like many things about this beer it’s a bit. er. different. The temperature from the fridge is a disappointing 48f, a long wait…. in just a couple go minutes it’s moved to 50f so that’s winning. Plus I get a sneaky little sample from the probe, probably not hygienic mind, but hey it’s just me and I know where my mouth has been. So completely obsessed with temperature I forgot the aroma in the glass thing, and it’s a big glass so there’s plenty of time for it to form and become itself I think. It’s a boozy steeped dark fruit note that I pick out most, there’s also a marzipan the thing in there too. That’s a monstrous mouthful of a beer. An almost indescribable thing. A complete slam of things, none of which are easily picked out. Mostly Alcohol tang is what I get, and I’m trying hard to pick amongst it, but it isn’t easy and gentle as you want to be this is not an easy beer. Not undrinkable but not welcoming and inviting. A beer you have to take the time to drink, it’s not quaffing beer, it’s hardly sipping beer. The harsh part of me thinks that this is a beer that isn’t what they intended and they’ve double down on the bluff and gone all in on something, because you know fans be fans and that. It’s really hard to imagine the committee sitting around giving the full tick, that alcohol lead is really difficult. Perhaps the most uncomfortable and unenjoyable beer I’ve had in a long long time, it’s hard to like a beer like this, although I’m sure there are some die-hard people with different palate that thinks this is the ducks nuts. The beer is at 60f now, so in that sweet spot, and to be honest I’ve got myself to blame. The burn hasn’t lessened and the faint notes that this could be a Quadrupel are still hiding. This is audacious and extreme even if it’s not great of brilliant, it’s at the edge of something, madness probably, and if it is ‘as intended’ then all well and good, but that nagging doubt that this has been in some way rescued does not escape me. Finally as it warms to optimum this becomes almost impossible to enjoy and each mouthful is a trepidation. The pdubyah-o-meter rates this as 7 of its things from the thing. Honestly this is not a good beer, and it’s not even a showcase of showing off. I really think that this beer was good on paper but not so good in a glass. A pity as I generally liked Epic beers who go all in on a flavour point or peak and generally hit it. Where did I get it? I got mine at a Liquorland but with looking you’ll find one. Am I enjoying it? No, this is not beer you enjoy. Would I have another? No, it’s hard to image a scenario where I would. Would I share with a friend on a porch and set the world to rights? It’s probably yes, because this is audacious and extreme even if it’s not great of brilliant, it’s at the edge of something, madness probably, and if it is ‘as intended’ then worth appraising without distraction. 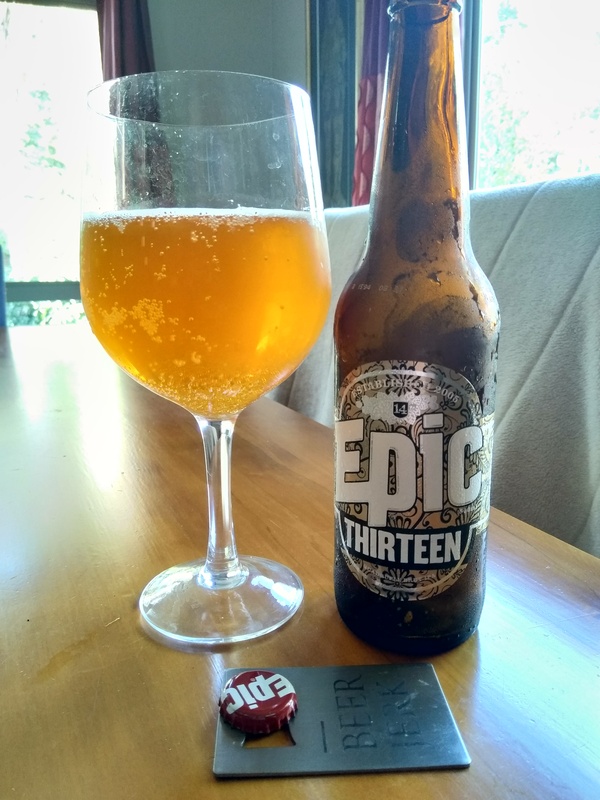 This entry was posted on February 8, 2019 by Philip Walter in Beer Review, Craft Beer, Critic and tagged Brut IPA, Epic Brewing Company, Epic Thirteen.